Joint letter and statement from all Political Parties in the Banbury Constituency. 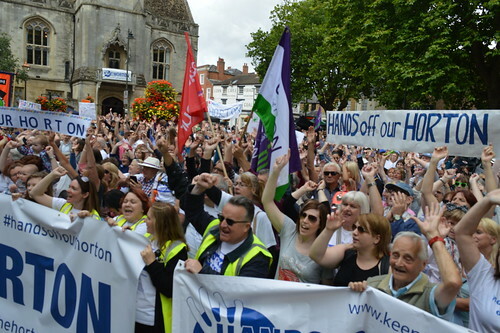 Following the Oxford NHS Trust Board’s extraordinary meeting about the suspension of obstetric services at the Horton General Hospital, we as representatives of all the main Political Parties in the Banbury Constituency wish to put on record our concerns and to show a unified front in support of the staff at our hospital and the Keep the Horton General committee. This unity amongst Politicians of the area is almost unprecedented and shows that as we stood together the last time the services were under threat ten years ago, so we are today, united in opposition to the decision taken. We have major concerns about the way in which the Trust has communicated their plans, and the recruitment process itself. They now say they will aim to recruit for January,so we hope they will do all that is possible to meet their own deadline. Downgrading the unit to a midwife-only service, leading to women in labour having to travel to the John Radcliff consultant-led unit an hour’s drive away, will put the lives of both mothers and babies at risk. We believe the decision to downgrade the service at the Horton, even on a temporary basis is wrong. We can’t understand why the Trust has not implemented locum support or temporary cover until recruitment is successful. Indeed if it is seen as fair for a pregnant mother in difficulty to travel to Oxford then surely a temporary measure of a consultant travelling to Banbury is feasible? We also ask the Trust that any decision taken on this issue will not impact on other acute services at the Horton.. Political Parties locally will continue to put our own lesser differences aside and support Keep The Horton General, and together will monitor the Trust and its stated aims to recruit for the new year to secure the future of the Horton General Hospital for our constituents and the residents we serve. Banbury has a thriving community complemented by the good variety of individual niche coffee shops around the town. The Banbury café culture is also fast becoming world-renowned, and for good reason. TODAY, and get your event listed on our popular what’s on guide. The Banburyshire Info What’s On Guide. Simply the best entertainment guide in the Banbury area.